I logged onto to eBay one day and saw a listing for "Vintage Wooden Puzzels". 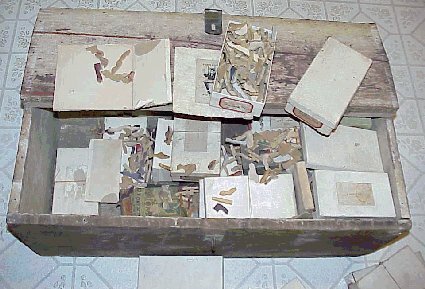 The description was: "There are 45 individual puzzels boxed seperately, a few in tin boxes. Each puzzel has a name, number, and initials. They come in a unique chest." I was the first bidder and bid a little more than the required opening bid, figuring that I would probably have to increase my bid before the end of the auction. A week went by and the only other bid came just before closing but it was only for a slight increase over the opening bid amount and I won the auction with my original bid. A week later UPS showed up with an old, wooden trunk. The seller had put a couple of screws thru the lid, some tape on a few seams, and added a shipping label. After I got the screws out, I discovered that was pretty much all that he had done. There was no packing material in the trunk.A few of the boxes were tied but most were not and several of the lids had come off in transit, one box had split at the seams, and there were loose pieces from various puzzles all mixed together. The boxes were pretty filthy and there was a lot of dirt, dust, spider webs and dead bug parts in the mix. It looked like this trunk had been in someone's attic or basement for many years. Many of the loose pieces in the bottom of the trunk had obviously been there a long time and the paper had separated from the wood. I used a sponge to clean all of the boxes and dirty pieces, and then put all of the loose pieces into one bag. One puzzle had water damage and between the warping, paper separation and dirt, I just threw the box in the trash. I was ready to "provide some negative feedback" directly to the seller but a held off the impulse long enough to assemble a puzzle that was in one of the smaller boxes. It was missing three pieces. I selected another one and in the course of turning over the pieces, I found a piece that obviously did not fit in, and in fact it was one of the missing pieces from the first puzzle. I found the second puzzle to be a real challenge and its title was Pierette. I absolutely loved the puzzle and realizing that Pierette was worth about 5 times what I had paid for the whole trunk, I felt I could muster up some brief positive feedback. I attempted to sort out the bag of loose parts and papers and spent all of my free time doing puzzles. The boxes had the number of pieces printed on them, but as I started each puzzle I would do a count and sometimes come up short and sometimes have too many. Even when the count was correct, I would often have some pieces that didn't belong. In the middle of doing one puzzle, I would recognize a piece and run upstairs to place it in one of the previous puzzles. 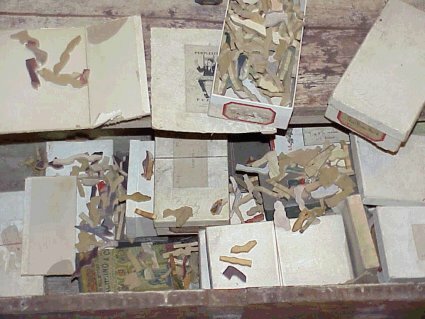 As I worked through the trunk, I would be disapointed that a puzzle was incomplete, but a day or two later I would come across the missing piece and eventually most of the puzzles turned out to be complete. The box that I threw into the trash really haunted me. Unfortunately, trash pick-up had been made and I couldn't retrieve it. I may have thrown away a piece or two from other puzzles. I won't do that again. I knew the collector who bid against me and I had to put this picture together to send to him. It occupied a space on my floor of about 4ft x 5ft and I had to go upstairs to get it all into the camera frame. It is not all of the puzzles and in fact, some of the missing pieces in this picture were found. Anne Williams told me of a phrase that is used in England, "little gloats." A perfect description and I am happy to share with you one of my "little gloats"! I didn't rub it in too much and in fact I promised the other bidder one of the puzzles. I haven't done that yet, but here it is in writing and I imagine that he (and another collector that I made the same promise to) has not forgotten. If you count having to solve a huge mess, I really did end up with 45 puzzles. One puzzle in the trunk was a Perplexity brand made by Mrs. Hayden Richardson in 1911. A few were in old cigarette tins or boxes from various merchants. All of these were from New York, so that may be a clue for the origin of these puzzles. Stylistically, these random box puzzles are different from the rest. One puzzle from this second group has a note on the inside of the lid, "S.G.G for her birthday. Made by C.H.G. 29 June 1910". There are 4-5 puzzles cut in the same style as this one. Most of the rest were in plain white boxes with hand printed labels on the box end and some also had typewritten labels on the cover with the initials G.K.D. Many had little notes about the title and dates or simply, "all here Christmas 1914" or "missing one, summer 1918." I don't know who G.K.D. was; I'm guessing that the handwriting belongs to a woman. All of the puzzles were well cut and challenging. I am very happy to be the current caretaker of her puzzles and I will do a better job than the previous owner(s)!